To claim this profile, please confirm you are Sydney Bullen. To follow this profile, please let us know your relationship to Sydney Bullen. Sydney's lacrosse stats have been updated for the win vs. Grandview. The Mullen varsity lacrosse team won Thursday's home conference game against Grandview (Aurora, CO) by a score of 15-5. Sydney's lacrosse stats have been updated for the win vs. Cherokee Trail. RESULTWin Girls varsity lacrosse vs. Cherokee Trail. The Mullen varsity lacrosse team won Friday's home conference game against Cherokee Trail (Aurora, CO) by a score of 14-2. The Mullen varsity lacrosse team lost Monday's away non-conference game against Denver East (Denver, CO) by a score of 13-12. The Mullen varsity lacrosse team lost Thursday's home conference game against Cherry Creek (Greenwood Village, CO) by a score of 13-3. Sydney's lacrosse stats have been updated for the loss @ Colorado Academy. 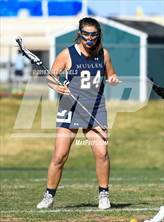 The Mullen varsity lacrosse team lost Monday's away non-conference game against Colorado Academy (Denver, CO) by a score of 19-2. Sydney's lacrosse stats have been updated for the loss @ Cathedral Catholic. RESULTLoss Girls varsity lacrosse @ Cathedral Catholic. The Mullen varsity lacrosse team lost Friday's away non-conference game against Cathedral Catholic (San Diego, CA) by a score of 8-7. Sydney's lacrosse stats have been updated for the loss @ Canyon Crest Academy. RESULTLoss Girls varsity lacrosse @ Canyon Crest Academy. The Mullen varsity lacrosse team lost Wednesday's away non-conference game against Canyon Crest Academy (San Diego, CA) by a score of 10-7. Sydney's lacrosse stats have been updated for the win vs. Chatfield. RESULTWin Girls varsity lacrosse vs. Chatfield. The Mullen varsity lacrosse team won Friday's home non-conference game against Chatfield (Littleton, CO) by a score of 17-4. The Mullen varsity lacrosse team won Tuesday's home non-conference game against Palmer Ridge (Monument, CO) by a score of 14-7. RESULTWin Girls varsity lacrosse @ Golden. 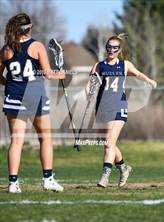 The Mullen varsity lacrosse team won Friday's away non-conference game against Golden (CO) by a score of 18-12. The Mullen varsity swimming team has not entered their place at their playoff meet: "2019 CHSAA Class 4A State Championships." The Mullen varsity swimming team placed 5th of 8 at their conference meet: "Centennial League Championship Finals." The Mullen varsity swimming team has not entered their place at their conference meet: "Centennial League Championship Prelims Swimming."